Don’t Be Misled By Marketing Hype: Noted Industry Experts Say “Pollen Counting” Not A Reliable Way To Determine Authenticity Or Effectiveness Of New Zealand Manuka Honey. Showcasing yet again the reality-altering power of “creative marketing,” several brands in the rapidly-growing Manuka honey category are trying to validate the purity and effectiveness of their products by relying on pollen counts and other grading systems as a supposedly authoritative form of testing. For consumers seeking high-quality Manuka honey products from New Zealand that can enhance their cuisine and potentially improve their health, a high pollen count would, on the surface, seem to make perfect sense. Honey. Bees. Pollen. What could possibly be wrong with that equation? As it turns out – a great deal. According to John Rawcliffe, General Manager of New Zealand’s respected Unique Manuka Factor (UMF) Honey Association, developing a fool-proof definition of Manuka honey has proven easier said than done over the years, but pollen counts (the measurement of the concentration of pollen trapped in honey) are certainly not the answer. Agreeing with that assessment three years ago, Dr. Adrian Charlton of Britain’s Food and Environment Research Agency food laboratory – where over 500 scientists work to protect the public from adulterated and mislabeled food – noted that pollen analysis is subjective and invariably less accurate than other forms of testing. At the root of this recurring inaccuracy: human error and the addition of extra pollen by unscrupulous manufacturers hoping to instantly transform ordinary honey into “fake Manuka” bearing a much higher price tag. Dr. Charlton also noted that industry leaders should rely on the world’s scientists and testing laboratories to work out the best methods for testing since there still is no official definition for Manuka honey – an obvious explanation for the many questionable products on the market today both in the U.S. and around the world. Most experts today believe that true Manuka honey should – and hopefully soon will – be graded on the concentration of MG (methylglyoxal), UMF (Unique Manuka Factor) or leptospirin. The New Zealand Government will mandate in 2017 new requirements for true Manuka labeling based on the MG, UMF and leptospirin concentration. With roots in the therapeutic wound dressings of the indigenous Maori people of New Zealand, Manuka Honey has been embraced worldwide as a coveted food, beauty and healing resource. Manuka is a monofloral honey, which means it is created by bees that feed solely on the nectar of the white flowers that adorn the Manuka bush, native to New Zealand’s North Island. In addition to its rich culinary attributes, Manuka Honey is widely believed to help treat minor wounds and burns, and some studies have shown it may help reduce systemic inflammation; reduce ear, eye and sinus infection symptoms; reduce gastrointestinal problems; lower cholesterol; and aid in the treatment of diabetes. Like many items in the “natural products” arena, Manuka money is rather easily susceptible to misleading or even downright false labeling, advertising and marketing – unfortunately putting the onus on consumers to separate fact from fiction when considering their next purchases. And given that many consumers in America (and elsewhere) are relatively new to Manuka honey – a rather exotic product from the other side of the world – it’s no wonder that companies are hoping hype-driven terms such as “pollen counts” will attract customers in an increasingly competitive retail environment. 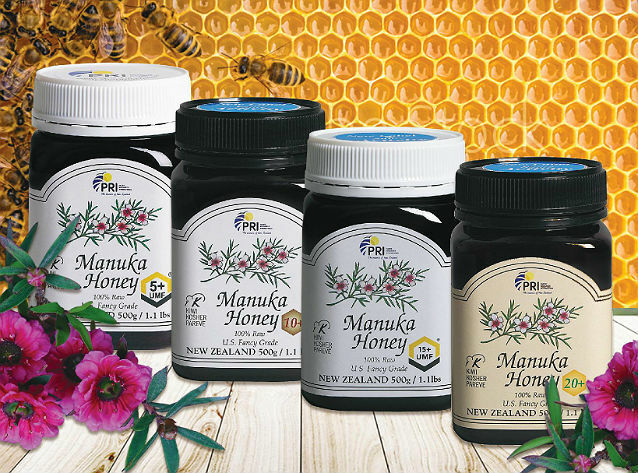 Not surprisingly, the authenticity of Manuka Honey is of considerable importance to the Southern California-based Pacific Resources International (www.shoppri.com) – which four decades ago became the first company to introduce New Zealand Manuka Honey to American consumers. Just bought the PRI manuka honey for my wife’s mrsa.hopping it will work read other reviews saying it’s a blend and not the real deal. Evause no UMF label it just says 20+ I’m hopping it works for her out break and is the real deal pretty much have tried every thing else.a response would be awesome thanks. Thank you for contacting us. We carry two types of Certified Activity Manuka Honey. Every batch is tested and grated for strength. Active Manuka Honey 5+ – 20+ is graded for its peroxide activity (PA) for antibacterial benefits and Manuka Honey UMF (Unique Manuka Factor) 5+ – 15+ graded for its peroxide (PA) and non-peroxide activity (NPA or UMF). Manuka honey needs to have a high presence of DHA (dihydroxyacetone), MG (Methylglyoxal), and Leptosperin to be graded a UMF Manuka Honey. There have been reports that MRSA has been helped with as low as the 5+ and the 20+ has been used as well. These have PA activity (peroxide activity) But with conditions that are serious, like MRSA, it is probably better to use the UMF that has both the PA activity and the NPA (non-peroxide activity). Regarding the Blend issue, there are no honeys that are 100% pure as bees cannot be controlled where they fly. That is why we have every batch tested in an independent lab in New Zealand for the exact activity. It is the activity that is more important, as without the activity the honey would be of little use.There is a lot of Manuka Honey that is tested that has little or no activity to be found. Again, that is why we insist on every batch to be tested before it is imported to the US. There will be a batch number on the jar that you purchased and if you would like we can send to you the test from the lab for that honey. Generally speaking, the 20+ does have a UMF factor as well but it would be below 10+ UMF.